You simply cannot bring yourself to hand something this beautiful over to an airline. 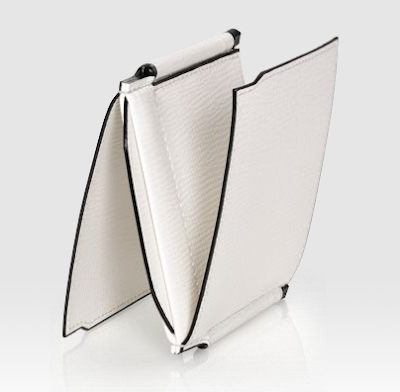 Valextra is making these pieces--the Apple computers of leather goods. Stop it, Valextra, with your space-alien superstyle and your Next Generation name. The people of Earth aren't ready. Left: "Avietta" grained leather overnight bag with wheels, pergamena white. 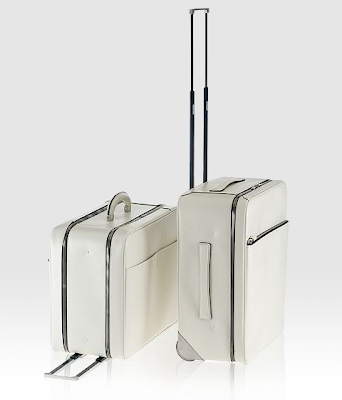 Right: Grained leather carry-on with wheels, pergamena white. "Grip spring" grained leather money clip wallet, pergamena white. What God's desk looks like. No words in the book because S/He's all-knowing. Soft leather "Carita" bag, sand.